CANNON, Clarence Andrew, a Representative from Missouri; born in Elsberry, Lincoln County, Mo., April 11, 1879; was graduated from La Grange Junior College, Hannibal, Mo., in 1901, from William Jewell College, Liberty, Mo., in 1903, and from the law department of the University of Missouri at Columbia in 1908; professor of history, Stephens College, Columbia, Mo., 1904-1908; was admitted to the bar in 1908 and commenced practice in Troy, Mo. ; in 1911 became a clerk in the office of the Speaker of the House; parliamentarian of the House of Representatives in the Sixty-fourth, Sixty-fifth, and Sixty-sixth Congresses, 1915-1920; parliamentarian of the Democratic National Conventions 1920-1960; author of "A Synopsis of the Procedure of the House (1918)," "Procedure in the House of Representatives (1920)," and "Cannon's Procedure (1928)," subsequent editions of the latter being published periodically by resolutions of the House until 1963; editor and compiler of "Precedents of the House of Representatives" by act of Congress; regent of the Smithsonian Institution 1935-1964; elected as a Democrat to the Sixty-eighth and to the twenty succeeding Congresses and served from March 4, 1923, until his death in Washington, D.C., May 12, 1964; chairman, Committee on Appropriations (Seventy-seventh through Seventy-ninth Congresses, Eighty-first and Eighty-second Congresses, and Eighty-fourth through Eighty-eighth Congresses); interment in Elsberry City Cemetery, Elsberry, Mo. Papers: In the Margaret Bayne Price Papers, 1918-1969, 25 linear feet. Other authors include Clarence Cannon. A finding aid is available in the library. Papers: 1896-1964, 37.6 linear feet. Public and private papers of a Democratic Congressman from Missouri's 9th District, 1932-1964. 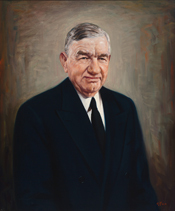 The collection is arranged alphabetically by topics and contains correspondence and other material relating to his life and congressional career. ------. The Cannon book. [N.p. ], 1958. ------. Cannon's Precedents of the House of Representatives of the United States including references to provisions of the Constitution. Washington: Government Printing Office, 1935-41. ------. "Congressional Responsibilities." American Political Science Review 42 (April 1948): 307-16. ------. The Dawson book. [Elsberry? Mo. ]: N.p., 1958. ------. The Kemper book. [Elsberry? Mo. ]: N.p., 1957. ------. The Mayes book. [Elsberry? Mo. ]: N.p., 1957. ------. A synopsis of procedure in the House of Representatives. [Washington]: N.p., 1920. ------. The Whiteside book. [Elsberry? Mo. ]: N.p., 1957. ------. The Wigginton book. [Elsberry? Mo. ]: N.p., 1958. ------. The Wilkinson book. [Elsberry? Mo. ]: N.p., 1957. Fulkerson, William M., Jr. "A Rhetorical Study of the Appropriations Speaking of Clarence Andrew Cannon in the House of Representatives, 1923-1964." Ph.D. diss., Michigan State University, East Lansing, 1970. Jarvis, Charles A. "Clarence Cannon, the Corn Cob Pipe, and the Hawley-Smoot Tariff." Missouri Historical Review 84 (January 1990): 151-65. Lilley, Stephen Ray. "The Early Career of Clarence Cannon, 1879-1924." Master's thesis, Northeast Missouri State University, 1976. ------. "A Minuteman for Years: Clarence Cannon and the Spirit of Volunteerism." Missouri Historical Review 75 (October 1980): 33-50. Shulse, Michael D. "The History and Development of the Clarence Cannon Dam and Reservoir, 1957-1968." Master's thesis, Northeast Missouri State University, 1975. United States. 88th Cong., 2d sess., 1964. Memorial services held in the House of Representatives and Senate of the United States, together with remarks presented in eulogy of Clarence Andrew Cannon, late a Representative from Missouri. Washington: Government Printing Office, 1964.